At the outset, The Phone Rang is a story about surviving cancer. But a closer look reveals it’s truly a story about love and family. Dr. Mary Reid Gaudio takes readers through the heart-wrenching story of her sister Ann who is diagnosed with leukemia. An illness in a family affects everyone and this family bands together to navigate frustration, concern and fear – finally arriving at hope. As Ann goes through chemotherapy and a bone-marrow transplant, she often enters a dream-like state and recounts stories from her days as a performer in “Funny Girl” with Carol Lawrence, “Hair,” “Waterloo” with Orson Welles, “It Can be Done Amigo” with Jack Palance, and “The Pirates of Penzance” with Pam Dawber and Jim Belushi. The family gathers around their sister to lend support and care for her throughout her recovery, finding solace at their Buffalo, NY farm that has been passed down through generations for over 160 years. Thankfully, Ann survives with a newfound appreciation for life and her family. 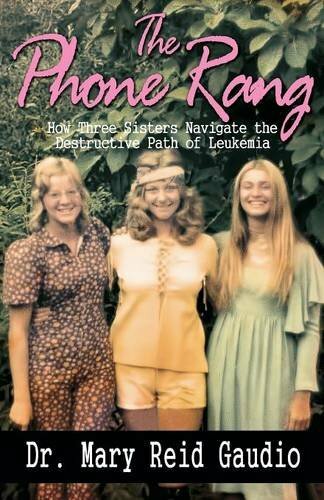 She now spends her time touring the country with her sisters, giving presentations on how to navigate leukemia’s destructive path and survive to tell the story. The family is so grateful for all the doctors and organizations that contributed to Ann’s recovery that a portion of the book’s proceeds are being donated to Roswell Park Cancer Institute, Hope Lodge in Buffalo, NY and weSpark in Sherman Oaks, CA. You can get the book at Barnes & Noble and Amazon.